Twelve Days of Christmas Book giveaway! I am proud to be included in this fabulous event just in time for Christmas… and… I am not alone. Some awesome authors are keeping me great company. 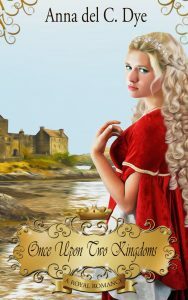 We have all kind of prizes to give away: I will give away 3 ebooks of “Once Upon two Kingdoms” to 3 lucky readers who leave a note and email in the comments of this blog. Freedom to Choose is Paramount for any human. Once Upon Two Kingdoms is a Young Adult Medieval Romance. It will be love by those who enjoy clean romance and a happy warm ending. But you don’t have to take my word for it. It was a delightful read that captured my attention from beginning to end. Elizabeth is a beautiful, young women with a strong will, and an even stronger sense of understanding and duty. I love that she doesn’t sigh and bemoan her life but takes charge and makes decisions. 2) This story is gentle and sweet, yet there are moments of mystery and adventure. Someone is out to take over some kingdoms–who and why? I came away with a smile at the antics and events that occurred, especially with the way the villain was confronted. This is a must read for anyone who loves a good, clean romance involving a princess. Content: very mild romance (although two characters spent a few nights together, nothing happened); no language or religious elements; mild violence (fighting, deaths–nothing at all graphic). Clean!